After our sightseeing through the west we were ready to find a place to just “hangout” for awhile. We thought Phoenix, AZ would be a good place to stay and we would be close to an airport for Bob’s last trip to Pittsburgh and to fly back to Michigan for Christmas. 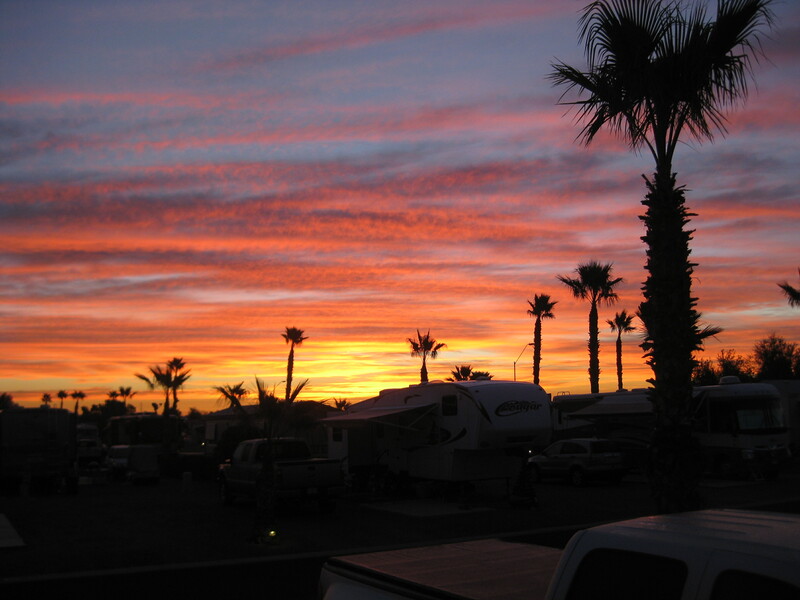 We decided to stay at the Pueblo El Mirage RV Park. This was our first stay at an “RV resort” and we weren’t sure what to expect. We were met by a guide in a golf cart that led us to our site and assisted us in backing into it. Once we were set up we rode our bikes to the office to complete the registration. We were given maps of the facility and the local area, told where grocery and drug stores were located, and given a list of the activities available to us. 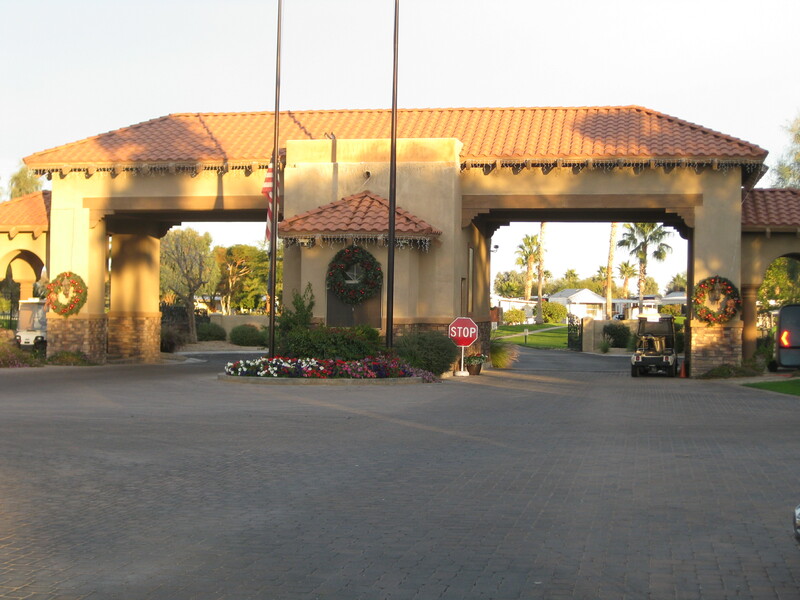 These included a full wood working shop; two swimming pools and a huge hot tub; an exercise room with treadmills, elliptical machines, weight machine and free weights; lawn bowling; and tennis and pickle ball courts. A couple of days into our stay there was an outdoor concert and we met some new friends, one of the couples was from Michigan! 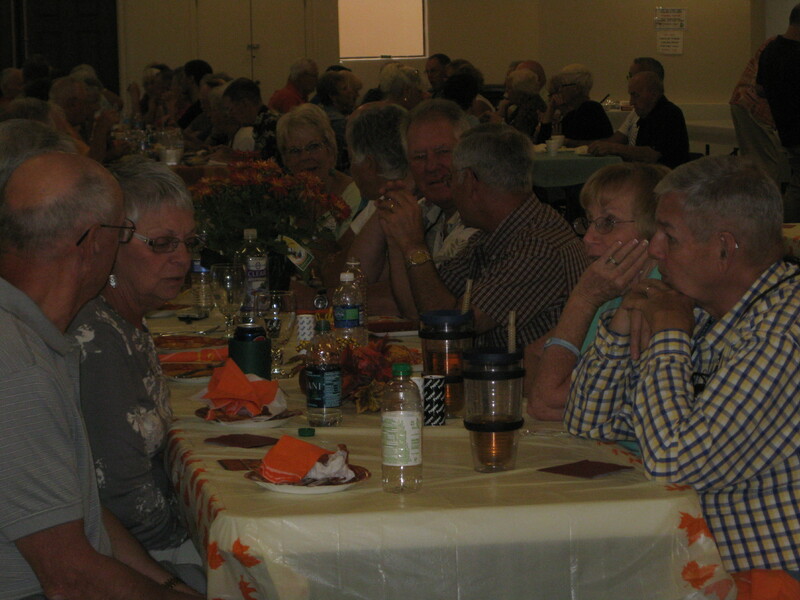 The resort sponsored an opportunity to join a group for Thanksgiving dinner, another chance to make new friends. 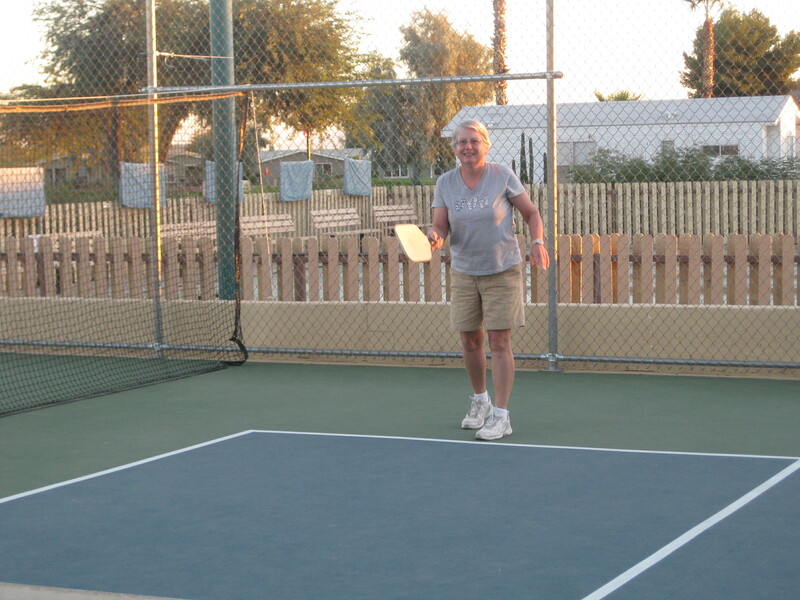 We decided to try pickle ball. This is a sport we had never heard of. It is a combination of tennis and ping-pong. The court is like a small tennis court, the racket is like a large ping-pong paddle, and the ball was a softball-sized wiffle ball. We took a couple lessons and then started practicing almost every afternoon. We got pretty good at it, but wonder if we will ever have the opportunity to play again as we travel farther east. 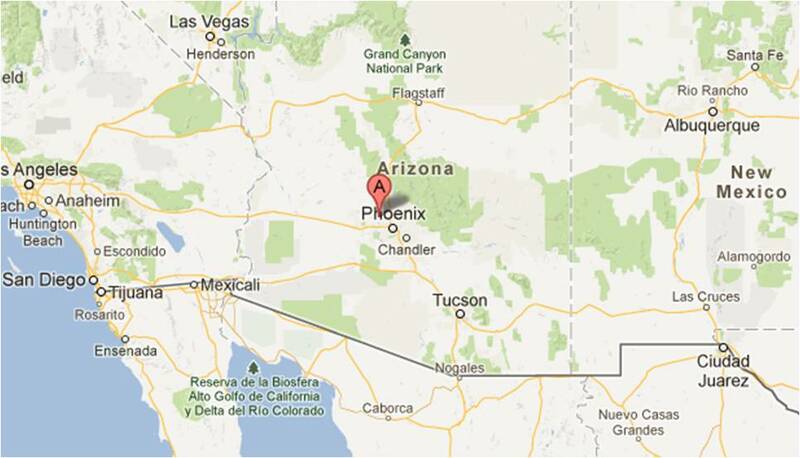 We made contact with some friends from Michigan who had moved to Phoenix years ago, Louis and Marilyn Astroth, and had them over for dinner one evening. We had a LOT to catch up on and it was a lot of fun to see old friends. An interesting feature of Phoenix is that there are mountains in the middle of town. 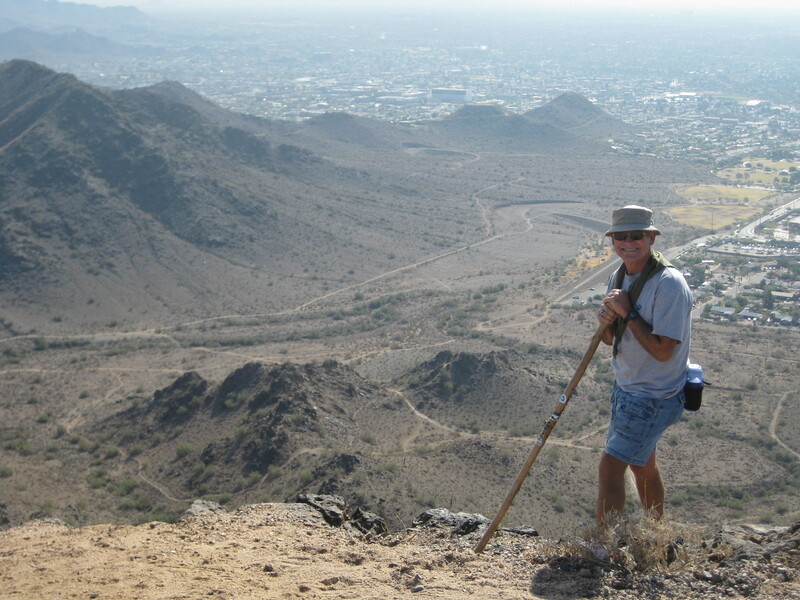 We took a morning for a short hike in North Mountain Park, which is in the center of the metropolitan area. It is a tribute to the vision of community leaders that they took action to protect areas like this from development. 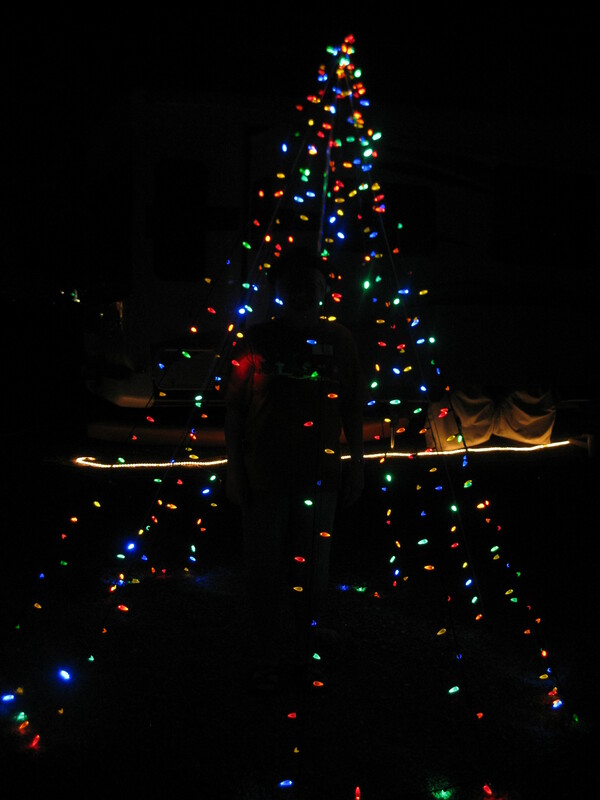 We made a tree from Christmas lights in our “yard” and decorated the inside of the trailer. Our inside Christmas tree is the small tree that Bob’s mother sent him while he was in Saudi Arabia during Desert Shield. We may not have a house, but we can still decorate for the Christmas holidays. 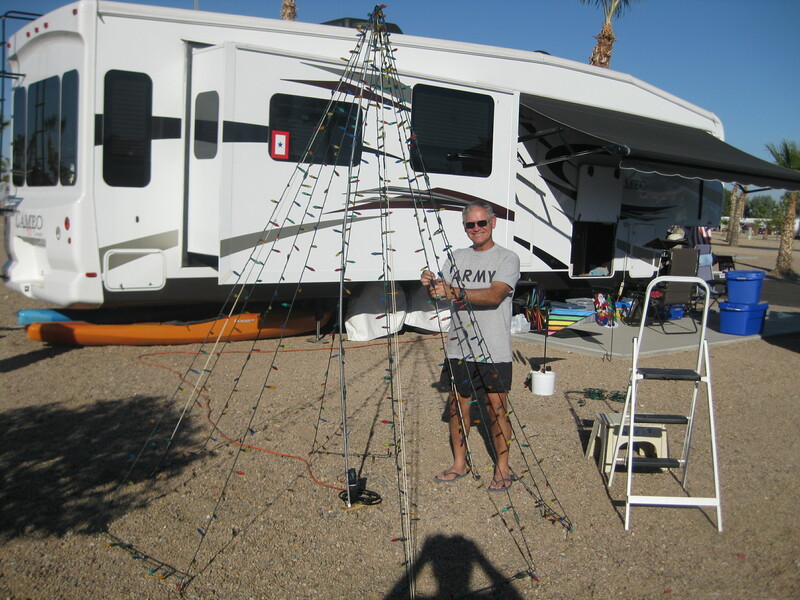 It was interesting to travel around the RV park and see what everyone had done for decorations, we have some new ideas for next year! Bob had more work than normal this month. He was off to Pittsburgh for the Corps of Engineers and then spent a week on the road for SkillPath Seminars in Louisville and Cincinnati presenting training in project management. We can’t remember the last time he was traveling for business this much. Pat enjoyed the opportunity to relax and do some Christmas shopping. 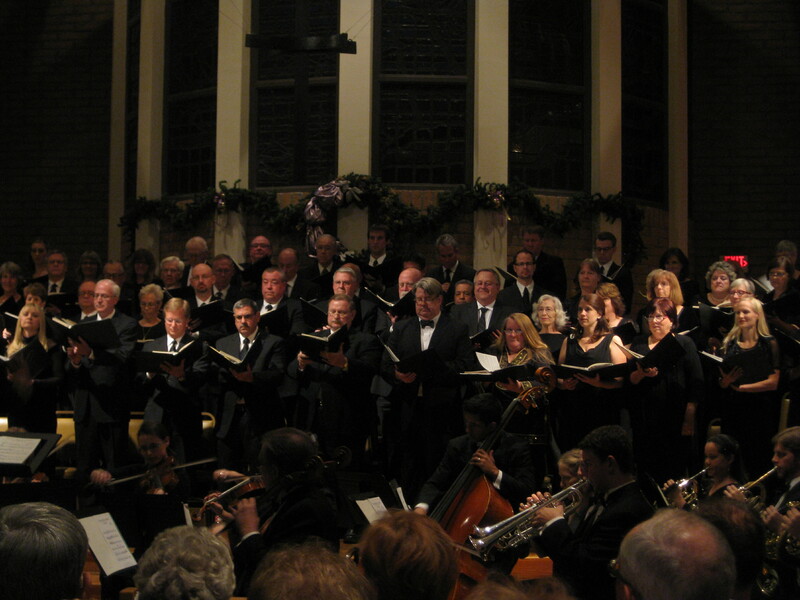 Louis and Marilyn are active in their church choir and have even traveled overseas for choir performances. 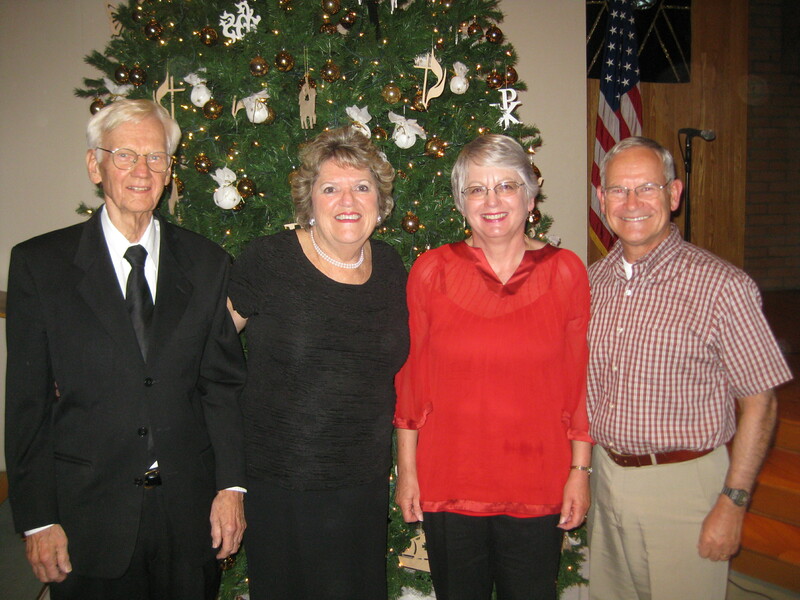 They invited us over to their house for dinner and then we joined them at their church for a marvelous Christmas concert. On December 19th we headed for Michigan to celebrate Christmas with our own family. See Home for the Holidays for the details. Bob has a friend, John Voreis, from his National Guard days who lives in Phoenix, but had been back in Michigan for most of our time here. He and his wife, Fran, joined us for dinner, and John and Bob had a wonderful time sharing stories of good times together. On Saturday, January 5th we were on our way again. Next stop – Kartchner Caverns. 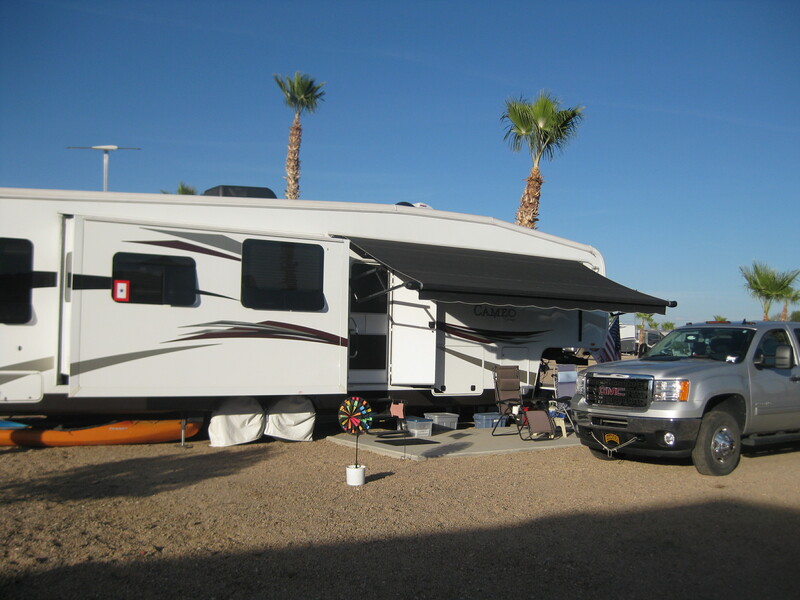 This entry was posted in Arizona, Fulltime RV, Holidays, Michigan Traveler, Working on the Road and tagged fifth wheel trailer, full-time RV, fulltime RV, North Mountain Park, Pickle Ball, Pueblo El Mirage, RV Forums, SkillPath Seminars. Bookmark the permalink. See if we can rent/borrow a couple of paddles and we can play this summer!